It's been a long time since I've been on a cruise . . .
Too long! Waiters, cooks, cabin attendants, sun... ahh...Or working, cooking, cleaning, laundry. Either way, life's a trip. 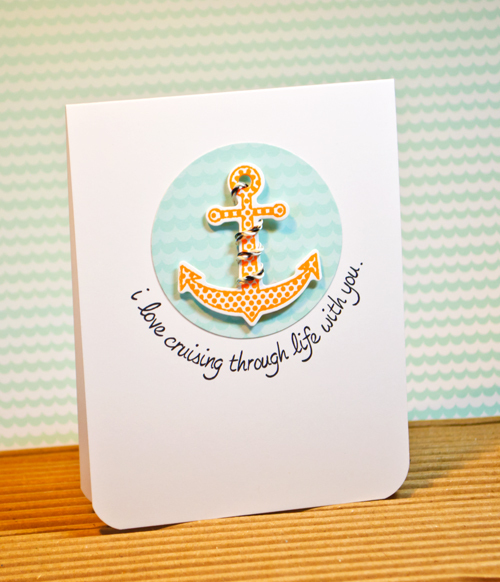 Fun card to make -- a dash of orange neon (Hero Arts anchor) set off by the Studio Calico blue patterned paper. Lawn Fawn sentiment. Like I said, fun! I made a card yesterday. The first in a long time. I like it and thought about taking its photo and describing how I made it. Then I remembered. I was at the gas station today and bumped into "M", who works at the nursing home where my mom spent the last year plus of her life. He took care of her. A million feelings flooded over me, and I started composing in my head. Then I remembered.